The West of Scotland Group of the 16mm Association promote Garden Railway Modelling in the scale of 16mm to 1 foot. Our main interest is operating live steam models on 32mm gauge track which represents a full size gauge of 2 feet. Our gallery gives a good idea of the models that we run and the railways that we visit. This is a photo taken by Bob Y on his garden railway in Argyllshire. We have members throughout West, West Central and South West Scotland and are always pleased to meet new enthusiasts. During spring, summer and autumn we meet on the first and third Sundays of each month at Track Days hosted by members in turn. In winter we usually meet monthly. We are all members of the Association of 16mm Narrow Gauge Modellers. 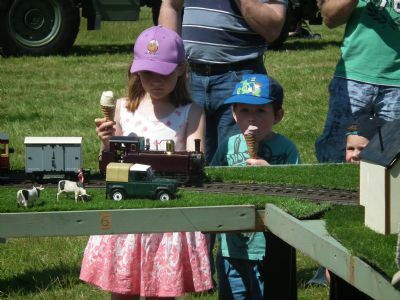 From time to time we operate our portable railway "Glendreich" at public events providing entertainment for young and old alike. Check the Calendar Page for forthcoming events.